It is well-known that counterfeit semiconductors are causing expense for both OEMs and CMs (contract manufacturers) who have to separate the good from the fraudulent. Often these parts are indistiguishable from the real thing, and will either not function, function poorly, or fail prematurely. This can leave someone facing a slew of expensive warranty claims. The recent requirement to meet RoHS compliance has encouraged bogus claims from cheaper, non-compliant parts. Even the military establishment is not immune. This article by John O'Boyle highlights how and why counterfeit parts are showing up in Iraq. Bogus chips enter the market in several ways, chip executives say. For example, obsolete or defective parts that are scheduled for destruction never actually reach the scrap heap: Second- and third -parties that are supposed to scrap the components may certify that they have been destroyed but instead sell them on the open market. 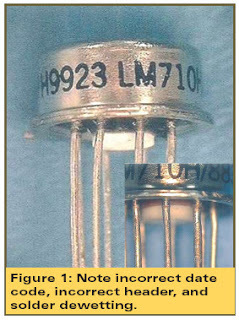 Sometimes old chips are pulled off printed circuit boards, re-marked and sold as new. Analog Devices found out about one chip a counterfeiter had reverse-engineered and sold as an ADI part. The usual advice to buyers is still "caveat emptor" - if the price from a broker looks too good to be true, it probably is. There are several sites (1, 2, 3) that list counterfeits as they find them - but clearly, there's no simple way for buyers to check yet. The SIA recently launched an anti-counterfeit task force, which included leaders from the semiconductor manufacturer and distributor industries (inlcuding Intel, TI, Analog Devices, Rochester Electronics). But perhaps the most novel way to raise awareness I've seen to date, is Rochester's short animation - in which Captain Rochester hunts down and replaces counterfeit components. We live in hope!